The Peat Inn near St Andrews in Scotland has been on wine and food lovers’ radar for decades. At the helm for quarter of a century was renowned chef David Wilson, before a new Chef/proprietor came on board in 2006 in the shape of Geoffrey Smeddle. 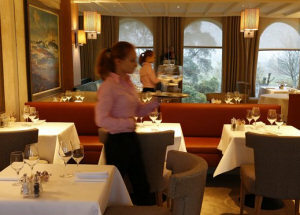 Smeddle has enhanced the reputation of one of Scotland’s best-loved dining rooms, earning a Michelin star in 2009 which he has retained since, delivering more modern haute-cuisine in a wonderfully relaxed country setting. On taking over, Geoffrey Smeddle and his wife Katherine carried out a tasteful update of the old place. The very French-inspired and traditional decor, with lots of floral patterns and heavy brocade, tapestries and acres of silverware was toned down, and a more muted colour scheme introduced. But it was a refresh rather a revolution. However, in the first couple of months of 2015 The Peat Inn closed its doors for a major refurbishment. Geoff Smeddle told me that if he was reviewing his own place, he’d describe it as “A jolly pleasant, contemporary country restaurant that wants to look after you,” which is succinct, accurate, but tells only a fraction of the story. The truth is that the refurbishment has been a spectacular success, and whilst both service and quality of food has been consistently excellent at the Peat Inn, I sensed there was a renewed spring in the step – both behind the stoves and front of house. The Smeddles have been careful to retain the charm, comfort and cosiness of their 18th century coaching inn – the original open fireplace still burns logs in the colder months, and the beautiful garden framed by large picture windows remains the focal point of the main dining room. But the makeover has touched every aspect and every corner of the Inn, creating a chic, contemporary space whilst retaining the highest levels of comfort and cosiness. That’s down to the quality of materials used and simplicity of design, but it is entirely successfully. Below: the lounge, before and after. The Peat Inn’s eight suites are housed in a separate residence just a few steps away. Each of the suites is different, seven of them split over two levels with a sitting room upstairs offering views over the garden to the lush Fife countryside, and en-suite bedroom downstairs. The cosy, thickly-carpeted sitting room has a work-desk in one corner, but is otherwise given over to relaxation with a comfy sofa, flat screen TV and sound system. There’s a supply of mineral waters, Sherry, coffee and home-made biscuits. Bedrooms have huge king-size beds and bathrooms sport all the luxury trappings including robes and spa toiletries. A homemade continental breakfast is served in your room by cheerful, bustling staff, who will set a table upstairs with copious amounts of fresh fruit and compotes, boiled eggs and local hams and cheeses, yoghurts, breads and croissants. The mood of the Peat Inn has always been fairly hushed, with the chatter of guests supplying the background music. But it would be a huge mistake to think of it as ‘formal’. You’ll be welcomed wearing (smart) jeans, though most guests do dress up a bit for this Michelin-starred experience, and whilst the staff are always discreet, just get any of them chatting and they’ll be as eager to enthuse over the Peat Inn’s food and surrounding countryside as anyone. The front of house team is expertly led by Restaurant Manager and wine aficionado Ian MacRae, and his wine list is worthy of note boasting 400 bins. Geoff Smeddle brings precision and modernity to classic, ingredient- and seasonally-led cuisine. An extremely fine dinner menu is available for just £45, as well as a seven-course tasting menu at £65. Lunch can be a real bargain with a simple menu of the day for just £19 for three courses, though we ate à la carte on our most recent visit, which at lunch will cost around £30 for three courses. Seared scallops with warm cucumber and caviar were as delicious and indulgent as it sounds: two scallops, seared to a wonderful, toffee-colour on the edges of their milky flesh, sat in a soulful mound of the warmed cucumber, a mouthful of which overflowed with flavour as the seafood melted in the mouth. It was one of those dishes where you cut smaller and smaller pieces as you eat, just to savour and prolong the enjoyment. My main course was magnificent too: a crown of wood pigeon, with a fabulously fruity black pudding, served with flowering sprout hearts, cute but flavour-packed young parsnips and a classic Madeira sauce. It was another dish that so cleverly married invention with tradition. Afterwards I spoke to Geoff about the black pudding, which he ‘designed’ and has made for him by a local butcher. For me, soufflé is normally irresistible, and so it proved here as I chose a hot blood orange soufflé with chocolate and Grand Marnier sauce. Sometimes soufflé can be rather wan and lacking in flavour, but not here, the essence of tangy orange infusing a fluffy, light middle as the dramatically dark, bitter-edged sauce melted through the soufflé’s crust. It was sensational, and lingered on the taste buds even as we sipped excellent espresso’s and elegant petit-fours to finish. The wine list at the Peat Inn was always a treasure trove of mature, great wines at rock bottom prices. Very few could have afforded to buy David Wilson’s extraordinary cellar, and indeed much was sold and many of the cherries made their way to the Wilson’s personal cellar. Though today’s list may not scale those extremely rare heights (and very few do), there is still plenty to delight, with mature bottles of great French crus at reasonable prices. Prices start under £30, however, and there are plenty of by the glass and half-bottle choices. I have to say that the Smeddles have done an extraordinary job in gently guiding this great restaurant with rooms in a new direction. For the food and wine lover, the Peat Inn experience is possibly even better than it ever was. A genuine Scottish treasure.